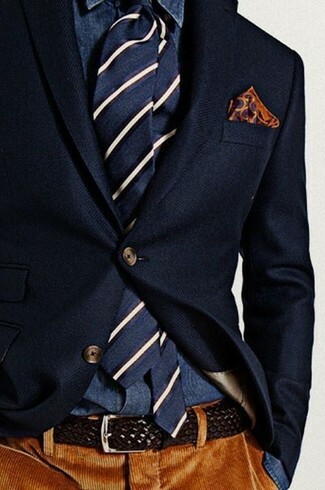 For a smart casual getup, pair a navy wool blazer with navy jeans — these pieces work perfectly well together. Throw in a pair of black leather low top sneakers to make the outfit current. 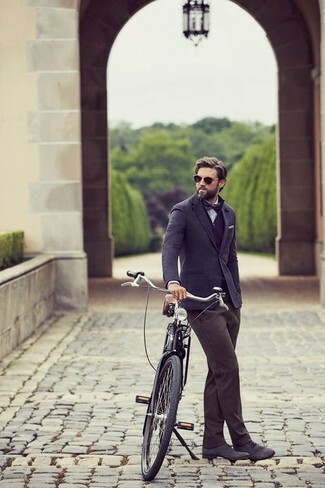 Look the best you possibly can in a BOSS x nordstrom nobis trim fit wool blazer and charcoal wool dress pants. Make dark brown suede desert boots your footwear choice to make the look more current. Consider wearing a BOSS x nordstrom nobis trim fit wool blazer from Nordstrom and navy wool dress pants for a sharp classy look. For something more on the daring side to finish off this outfit, grab a pair of brown woven leather sandals. 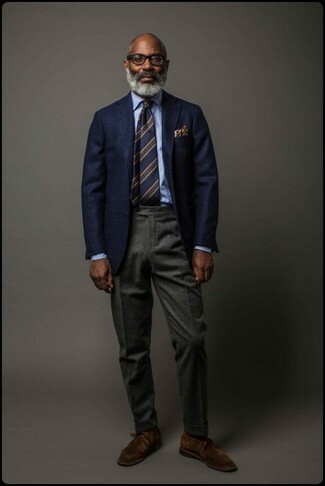 This combo of a navy wool blazer and black chinos is very easy to make up without a second thought, helping you look seriously stylish and ready for anything without spending a ton of time searching through your collection. Black and white athletic shoes will deliver more playfulness to your outfit. For a casually elegant getup, dress in a BOSS x nordstrom nobis trim fit wool blazer and charcoal chinos — these items go really nice together. 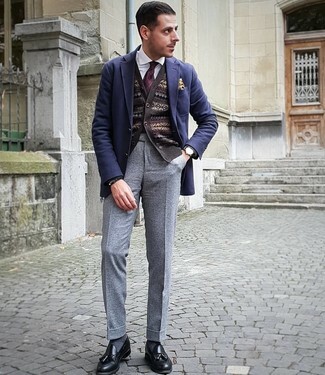 Navy suede brogues complement this getup very nicely. 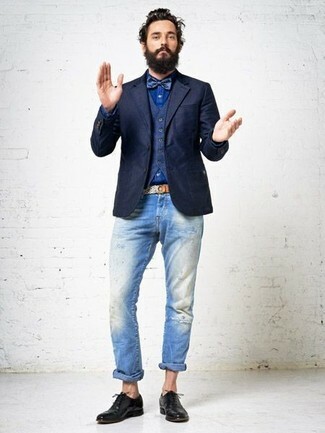 If you're in search of a casual yet dapper look, rock a navy wool blazer with light blue ripped jeans. Both pieces are totally comfortable and will look great together. Dress up this getup with black leather oxford shoes. 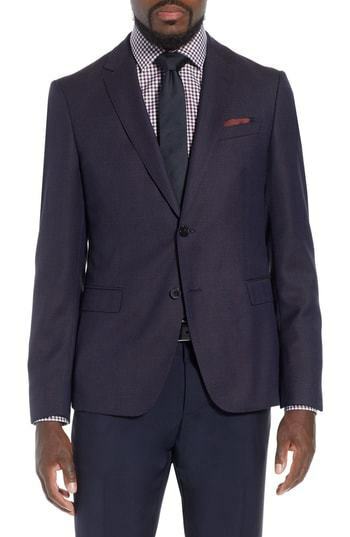 Try pairing a BOSS x nordstrom nobis trim fit wool blazer with grey wool dress pants for incredibly stylish attire. Add a sportier feel to your ensemble with black leather tassel loafers. Make a BOSS x nordstrom nobis trim fit wool blazer from Nordstrom and brown corduroy dress pants your outfit choice to ooze class and sophistication. For a nothing less than incredibly stylish look, make a BOSS x nordstrom nobis trim fit wool blazer from Nordstrom and grey wool dress pants your outfit choice. 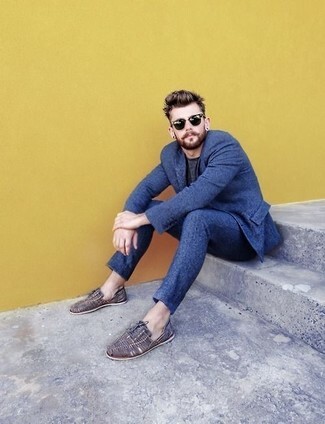 Tan leather oxford shoes will instantly lift up even the laziest of looks.